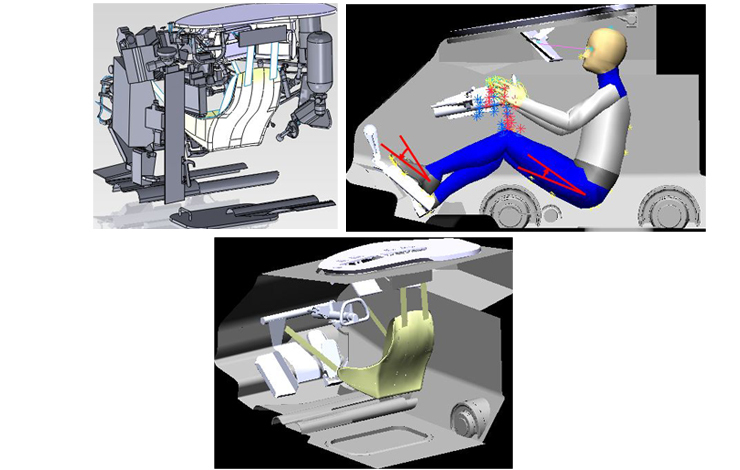 Often modifications or upgrades are made to the interior of vehicles without considering how they affect human operators. In this case, modifications were proposed for the driver footrest of the Leopard 2 tank. The impact on the driver’s ability to safely position themselves within the tank and operate it as necessary needed to be determined. We designed and developed a digital human model showing the impact of the modification. This model was then validated with actual users within the vehicle platform. The impact of the proposed design modifications were summarized with respect to the impact on the operator fit and accommodation, and used to help our client make design choices. Whether changing the foot pedal in a military vehicle, altering the design of a passenger car, an airplane or train, subtle changes can impact users. Seeing the impact of a proposed change in a digital model (before spending money on implementing the design, only to see it fail) makes good business sense. We can help.